One of the best modifications you can do to your truck, car, tractor, motorcycle, UTV, or anything else with wheels is to install an LED light bar. The entire purpose of an LED light bar is to see more at night time. If you are off-roading at high speed, the ability between seeing and not seeing can be life or death. There has been plenty of time when we were out wheeling and almost flew off a mountain, but having an LED light bar saved us. 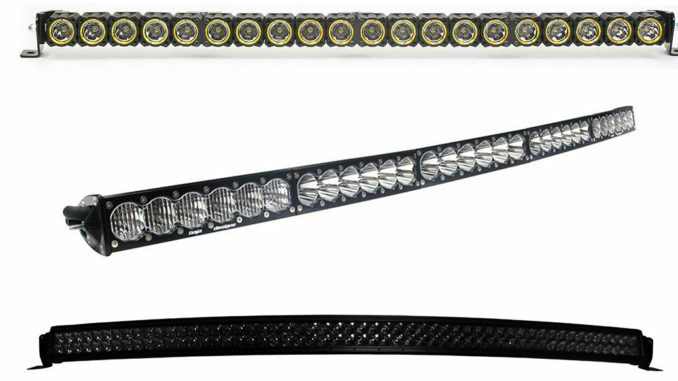 The most popular LED light bar size out there is the 50 inch curved. This size will fit almost any truck or SUV out there and the curved design matches almost every windshield curved out there. In this short guide, we will cover the best 50 inch light bars from most expensive to least expensive. We only recommend products we would buy ourselves. First up on our list is the Baja Design OnX6 50 Inch Arc. Baja Designs has long been a leader in the LED light bar industry. To this day their only real competitor is Rigid Industries who invited the LED light bar. The OnX6 uses deep and focused projectors to put the light far down the trail which is where you want it. This is part of the reason they use a single row design. The amount of R&D that goes into developing an LED light bar like this is extensive and ultimately drives the price up. You are getting a super high-quality product that uses innovative technology, but not everyone can afford it. Don’t worry though, we have much more budget-friendly LED light bars listed down below. This light bar from Baja Designs outputs an insane 32,350 lumens at 315 watts. This light output is achieved by using 30 Cree XM-L2 LEDs driven at 100%. They make the housing from aircraft grade aluminum, resulting in a lightweight and strong construction. It’s also IP69K rated which means it’s pretty water and dust proof. Plus, if you can somehow break it there is a lifetime warranty behind it. Second up our list is the Rigid Industries 50 inch RDS Midnight Edition. Like we mentioned above, Rigid Industries and Baja Designs have long been the leaders in the LED light bar market. Unlike the OnX6, the 50 inch RDS uses a double row design. Rigid Industries has deep and focused projectors, but not as much as Baja Designs. Rigid Industries offers a single row version of this light bar if you’d prefer that, but for the money, the dual row version is better. We picked the midnight edition because of its awesome looks. Rigid offers this exact light bar in a standard chrome version if you’d prefer that. Just like the Baja Designs light bar, this one is very expensive because of high-quality materials and lots of R&D. This 50 inch RDS from Rigid Industries outputs an impressive 26,150 lumens at 375W which is about 6,000 lumens less than the Baja Designs light bar listed above. This light bar is also water, dust, and shockproof. It also has a lifetime warranty if you break it. Third on our list is the 50 Inch Flex Series from KC HiLites. Although this light bar isn’t a curved LED light bar, you could make it curved thanks to the modular design. KC HiLites has been around for a long time. Although they aren’t a massive name in the light bar market, they have been producing off-road lights for over 40 years. What makes this LED light bar so special is its modular design. Since it’s an array of little light pods, you can add (or append for programming nerds) more to the array. This is useful if you want a bigger, smaller, taller, or shorter light bar array. This also means you can turn into a curved light bar which is what this guide is all about. KC HiLites uses deep projectors on this light bar which allows them to project the light very far down the trail. They also offer amber covers if you plan on driving in lots of dust. The 50 inch array outputs 24,375 lumens at 250W which is a high lumen/ratio. With this innovative design comes a high price, but if you want a nice modular setup, this is the only way to go. Getting into the budget-oriented products we have the 50 inch Black Series from Rough Country. Although Rough Country is most known for their budget suspension lift kits, they make halfway decent LED light bars. Their products are an excellent balance between innovation, quality, and price. There isn’t anything in particular that makes this LED light bar special. It’s just the standard run of the mill 50 inch curved using Cree LEDs, but their quality is higher than cheap Chinese light bars. We picked the Black Series because of its awesome looks, but they offer this exact light bar in a standard Chrome Series. Since this product is budget oriented, it lacks any real innovation. It does, however, output a respectable 23,040 lumens at 288 watts. This light output isn’t much less than the much more expensive light bars listed above, but the small projectors limit how far that light can be projected. Rough Country backs this light bar up with their three-year warranty. Fifth on our list is another product from Rough Country. Since they offer products at a superb price to quality ratio, we felt it was worth mentioning their more innovative line of light bars. The X5 series uses a third row of LEDs in between the standard two rows. This allows them to have a much higher lumen count at the cost of smaller projectors. If don’t plan on driving fast, then the smaller projectors won’t be a massive issue, but as soon as you get up to speed you’ll want better projectors. We would only recommend this product if you’re rock crawling or just doing simple trail riding. The X5 series could be much better if Rough Country increased the height of the light bar to allow larger projectors. The innovate design of the X5 series isn‘t ground-breaking, but it’s an innovation that demands a premium. That third row of LEDs bumps the lumen count up to 25,650 lumens at 285 watts. Rough Country light bars are IP67 water and dust resistant, but they aren’t shock resistant like Baja Designs or Rigid Industries light bars. They cover this light bar by the same three-year warranty as the one listed above. Auxbeam is becoming the biggest name is the Chinese LED light bar industry, and for good reason. We’ve used tons of Auxbeam products in the past with great success. Sure the build quality might not be the best, but the price is cheap and the projectors are halfway decent. Part of the reason this light bar is so cheap is its lack of innovation. Auxbeam makes innovative products, but this specific Auxbeam LED light bar isn’t anything special. You can find the type of projectors them use in many other Chinese light bars. The projector is just a standard reflector cup with a small projector on top. Auxbeam could push innovation by increasing the depth of the projector for a tighter and cleaner beam pattern. This light bar from Auxbeam outputs about 28,800 lumens at 288W. This is just an estimate given by Auxbeam which is adding the maximum output of each individual diode together. The real-world output is likely closer to 21,000 lumens. The low cost doesn’t allow for any kind of water or dust resistant. If you’re on a tight budget, then this is the light bar for you. Last, but not least, is the 50 inch 8D curved from Rigidhorse. In the past, we’ve said we are against decreasing the projector size to increase the number of diodes used and we still stand by that. You may like the quad row design because it’s decent for slow off-roading such as rock crawling. For high-speed off-roading, we recommend purchasing a light bar with large projectors. Luckily, Rigidhorse didn’t cheap out and use simple reflector cups. Although the projectors are tiny, they have a 5D design meaning there is a reflector cup under the projector lens. This light bar takes an insane amount of power to drive it, 888 watts to be exact. For some vehicles, this may be too much load on the alternator to function properly. Although we don’t like quad row light bars or the fact that Rigidhorse tried copying Rigid Industries name, we think this light bar is good for a budget product. The housing is IP67 water and dust resistant. We can’t find an exact lumen count for this light bar, but we would estimate it’s around 30,000 lumens. For a budget product, this light bar is hard to beat. Although this light bar isn’t a curved light bar, we thought it was worth mentioning. One of the biggest problems with LED light bars is picking between a flood beam or a spot beam design. One is good for slow off-roading and the other is good for high-speed off-roading. What if there was a light bar that could adapt to any situation? Rigid Industries pushed the envelope and developed the worlds first adaptive LED light bar. Although this light bar is expensive, there is no better light bar on the market. It works by measuring vehicle speed via GPS and changing the beam angle according. We have a full article explain everything about What Makes the Rigid Industries ADAPT so Cool. You may have noticed that we mentioned projectors quite a lot in this guide, and for good reason. An LED by itself doesn’t project the light anywhere, but just lets it emit in every direction forward. This means you aren’t putting the light on the trail which defeats the purpose of having an LED light bar. There are a few things that separate high-quality projectors from low-quality projectors. The depth of the reflector cup is important because it puts all the light emitting from the LED into one small direction. Obviously, a more reflective design is better because it will waste less light inside the reflector cup. The fisheye lens on top of the reflector cup magnifies the light into an even tighter beam. Clarity of the lens is important and in our experience, cheap light bars don’t have clear lenses. The curvature of the lens will also determine how tight the beam will be after the light passes through the lens. All of this takes lots of R&D to find the best balance between all of these factors which is why quality light bars are so much more expensive than cheap Chinese light bars. If you’re still confused about which LED light bar is best for you, be sure to check out our full Light Bar Buying Guide for more information.